This gallery contains all of my panoramic images in one gallery. A beam of light shines down onto the sea in front of a mountain. Light and shadow on the head of the Langdale Valley. 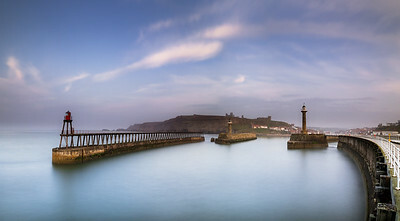 Panoramic image of Whitby's east pier. A colourful sunrise over Sea Palling beach sea defenses. Panoramic of Derwent Water in Cumbria and the hills beyond. A single common seal basking on a rock in the SOund of Jura. A panoramic image of trees refleted in a flooded field at the edge of Buttermere in the Lake District. Panoramic image of Derwent Water from Walla Crag. Sun setting over Whitby's harbour. Snowy panoramic image of the Trotternish Ridge on a winters morning. Panoramic of Derwent Water in Cumbria and the hills beyond in the mist. Catbells reflecting in the still waters of Derwent Water on a winters morning. Looking down to Thirlmere with the mountains of Skiddaw and Blencathra in the distance. Panoramic image of Wells beach huts at sunrise. Summer sunrise at Staithes from Cowbar Nab. Sunlight catching the cathedral on a misty morning over Norwich city. Panoramic image of the Black Cullin mountain range on a winters day. Looking down the valley towards Windermere from the Fairfield horseshoe walk. A panoramic view of Ludow on a summers evening. Misty morning looking across the reeds towards Thurn windpump. Panoramic image of Cley mill at sunrise in winter. Panoramic image of sunset over Kynance Cove.